Last spring as it became apparent that Grand Rapids Whitewater’s plans to return the Grand River to a more natural state (removing and lowering dams to restore the rapids) for ecological and recreational reasons were going to come to fruition we decided that our students HAD to get involved. A colleague and myself went to some open meetings last summer to make connections and find a way for our students to participate but failed. We sought out contacts all year and were unsuccessful. So we decided to just do it anyway. 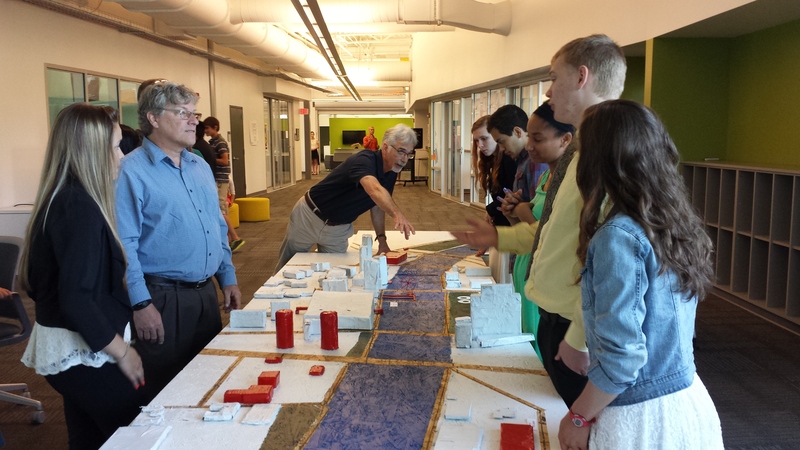 The Water Project was a sophomore project combining American Studies, Chemistry, and Geometry where students would work in one whole class group to redesign downtown Grand Rapids around the proposed changes in the Grand River. 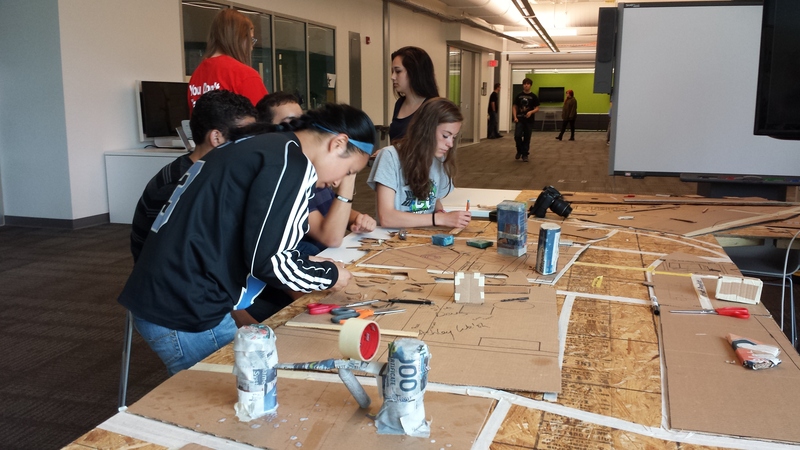 Yes, this project had ONE group of 80+ students working together. We made a big announcement to launch it and then students explored three options to pursue: design team, ecology team, or public relations team. 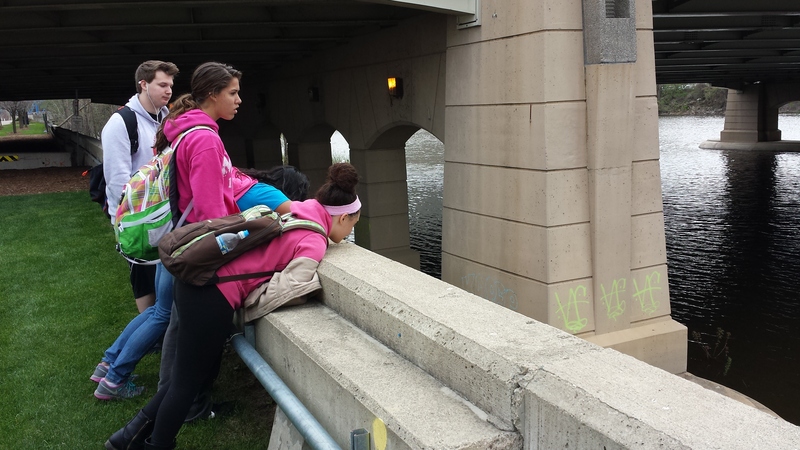 Ecology looked at the effects of the changes on the river considering both endangered and invasive species. 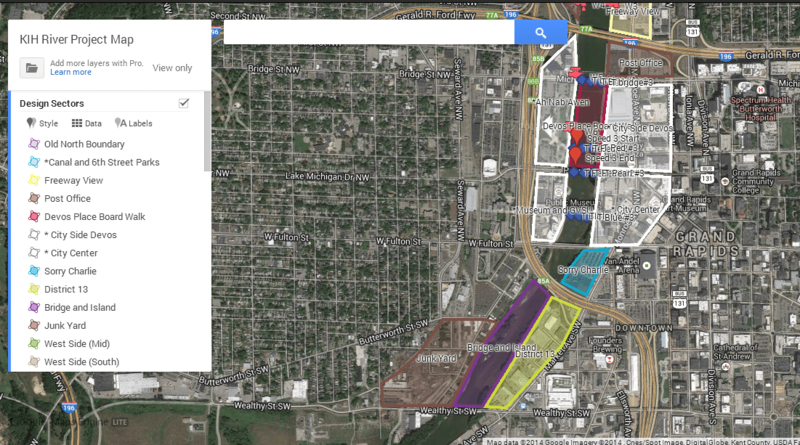 Design was in charge of redesigning the riverfront which was broken into sectors. Public relations had to research the issues and create a survey for public opinion. 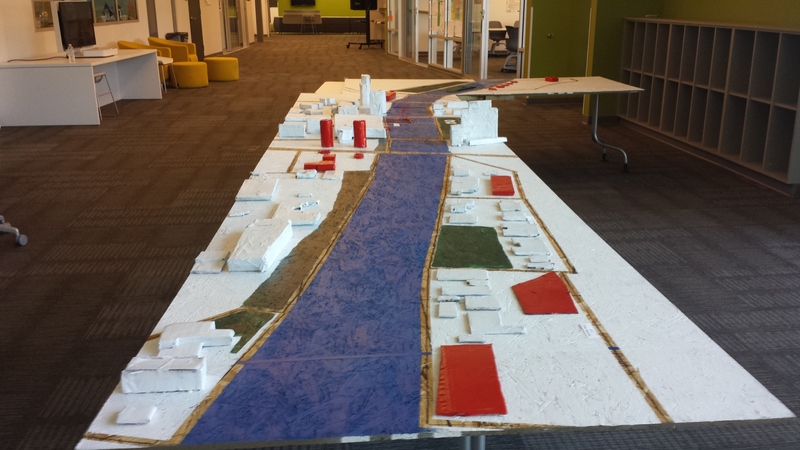 The final product was to be a 3D model of downtown GR. The task required the three teams to be in constant communication with each other. The third day of the project we went downtown and walked the whole stretch of the river dividing the class onto both sides. Students took pictures and documented their assigned sections. It also helped them dream what could be there instead. The PR team surveyed people that they met. When we got back to school the PR team reported that they had only surveyed 16 people because it was early morning and there were not that many people out. They asked if they could post it on Facebook and promote it there. We said sure. This is when the project took off. Students took over. Kenzie put it on Facebook and contacted all of the local media. Some of the media posted it. By the next day we had over 300 responses on our survey. Later we had over 700! Next students created their own Facebook, Twitter, and Instagram accounts for the project. We now had a social media branch of the PR team. They targeted news and local people involved in the Whitewater project. There was a buzz among the students as they started making connections and getting attention toward their project. Student leaders emerged and met to discuss issues. A favorite moment was during a meeting of self-selected leadership team when Ben said, “Wait, we really don’t need facilitators for this. We can handle this ourselves.” Students had truly taken over and “owned” the project. I think it is important to point out here that the reason that these things happened is that the teachers did not over plan the project. We had a big picture idea and some structures in place, but we also allowed flexibility and as the students came up with ideas that branched off from it we just told them to go for it. Meanwhile the final product had grown to include the 3D model, a website, posters showing details of proposed changes, and an overlaid map of all of the changes in Google Earth. All of these additions came from students as they took over the project. The icing on the cake was presentation day (which also was the students’ idea; we hadn’t planned one because we had no audience). Guests included one of the two founders of Grand Rapids Whitewater, people from the Grand Rapids museum, DEQ, and others actually involved in the River Project with the city. All of these contacts came from the social media campaign by the students. Where we had failed to make connections, students made it happen! I have never seen students more motivated! This is the power of a truly authentic audience. Students will respond to work that is real and for a real purpose. Here is an album of pictures showing the progress of the project. This entry was posted in Uncategorized and tagged #miched, #PBL, authentic audience, Grand Rapids, Grand River Whitewater, Kent Innovation High on June 11, 2014 by Michael Kaechele.